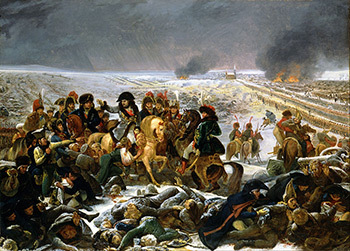 Though appointed by Napoleon Bonaparte to grandly depict the exploits of the French army, artist Antoine-Jean Gros instead depicted the destruction wrought by Napoleon’s army – death, trauma, mental illness – in a none-too-flattering light. 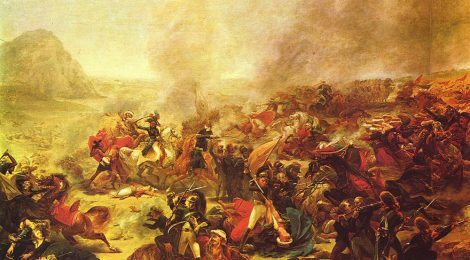 Gros’s unflinching depiction of suffering in the oil painting Napoléon on the Battlefield of Eylau departs significantly from the more reserved style typical of the early 19th century. The painting may show Napoleon in the centre, his hand held regally aloft, but the true subjects of the painting are in the foreground. Among the dead and injured are poor people salvaging items from corpses, and a mentally ill man being calmed by soldiers. The anguished faces of the fallen and the prostrate are painted twice as large as life, seemingly a testament to the painter’s sympathy for their suffering.